Both adults have P6 growing, P7 missing and P8-P10 old. 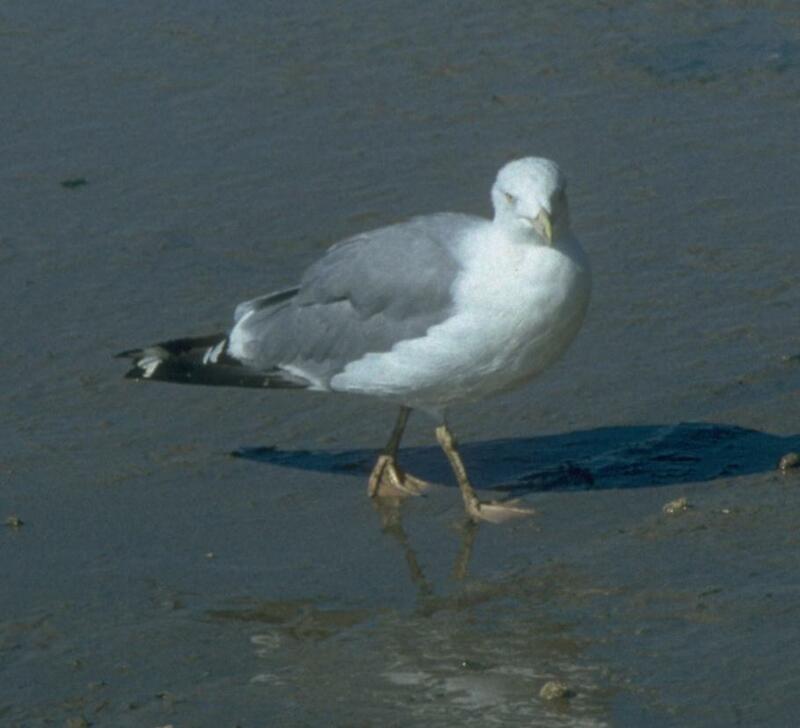 They both show large mirrors on P10, The first-summer is very heavy looking almost like Great Black-backed Gull Larus marinus. Head and neck are particularly heavy. Bill is starting to turn paler at base. Scapulars are showing adult grey and legs have a straw tinge. The head is quite white except for a dusky eye spot. 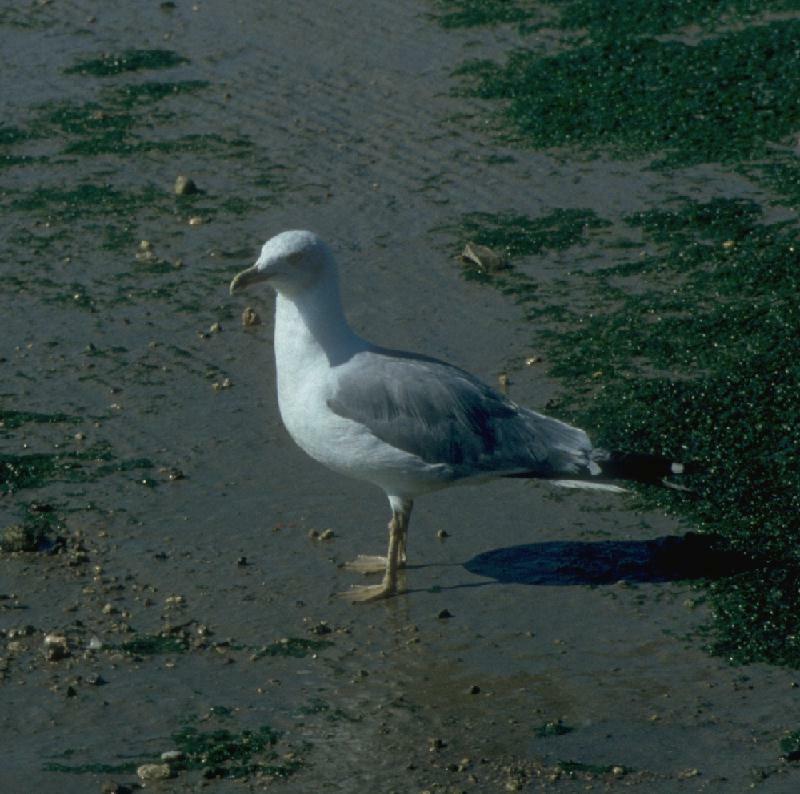 Quite a white head and clear yellow legs. Both P6 and P7 are new. P8 is missing and P9-P10 are old. Tip to P10 is outside that of P9. Mantle colour is a rather dull grey with only a slight blue tint. New P1-P4, growing P5, missing P6, old P7-P10 with mirror on P9 and large mirror on P10. 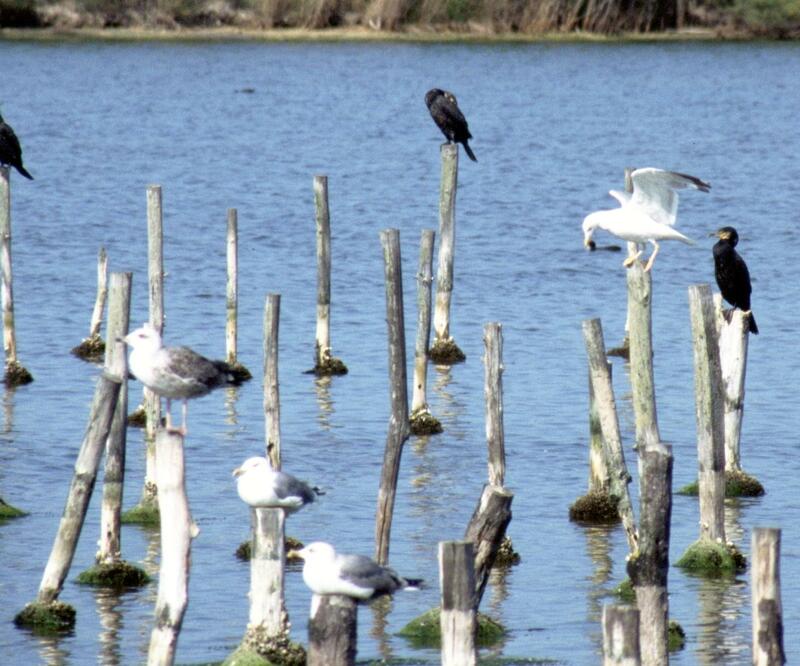 The large size and particularly the long legs of Mediterranean michahellis, compared to the Lesser Black-backed Gull Larus fuscus are indicated. A fairly smart individual, particularly compared to some of the third-summers. Very heavy bird, particularly on head and bill. Head is classical boxy shape. Legs are quite a bright yellow. 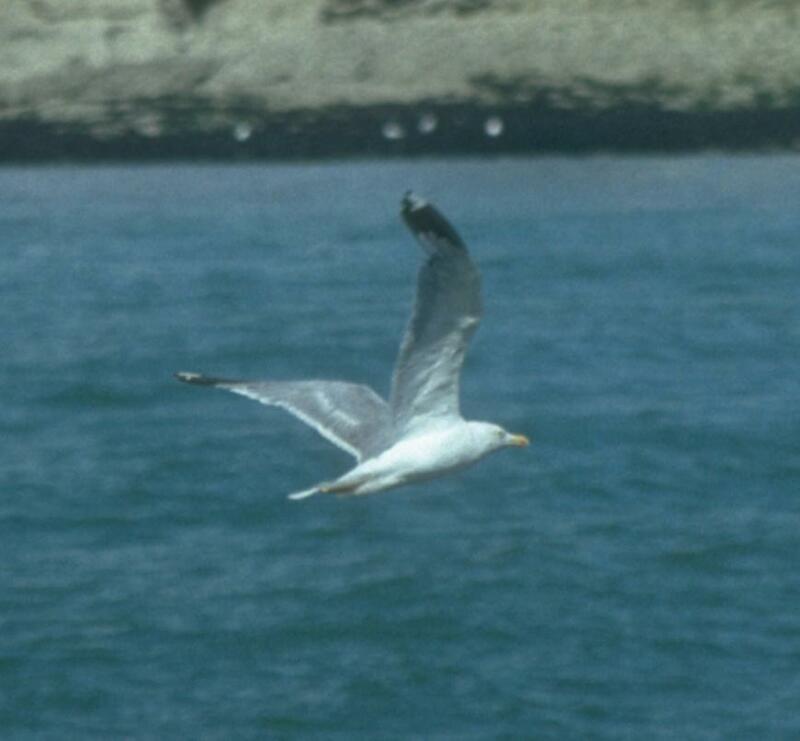 Bill is also a fairly bright yellow with a rather indistinct gonydeal spot. P6 is new, P7 growing, P8 missing. Mantle is a fairly pale wane grey colour. Legs are long, about 85% of body above. From right wing, large white mirror on P10 and no mirror on P9. In primary moult with P7/P8 missing. P6 shows extensive black on tip, P5 a broad band and P4 no spot. New P6/P7, P8/P9 shed and missing through moult, old P10. Solid bill with broad base. Head and chest are strong. Mantle is darkish purplish-grey. Difficult to assess leg length or colour. New P6, old P9/P10, missing P7/P8. Head is large and neck is thick. Solid bill with blunt culmen and reddish gonydeal spot not reaching the upper mandible. 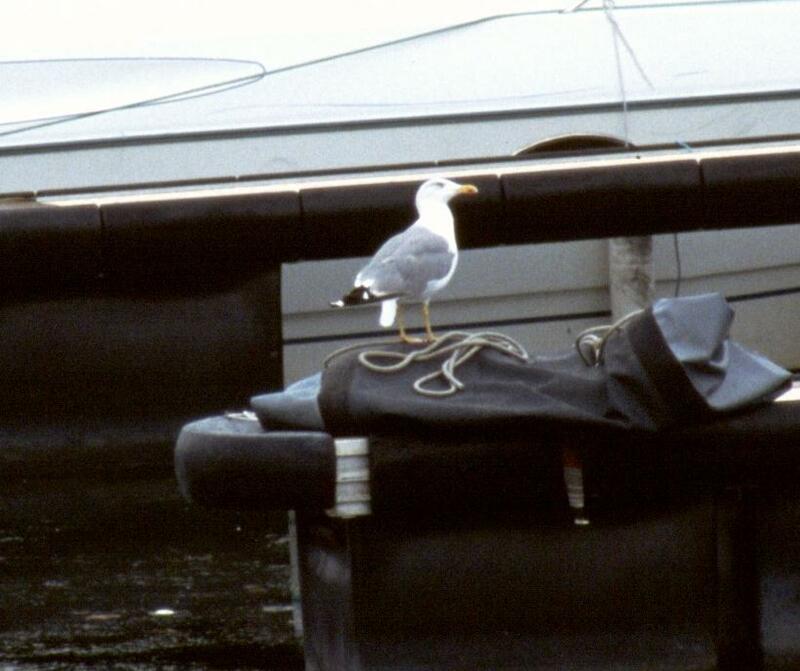 Bill is a bright yellow, legs are not bright but are a clear yellow in colour. Mantle is a dull steely grey. Tips are not bunched with P10 outside of P9. P8 is old. Distance P10-P9 is though smaller than P9-P8. Mottling on coverts suggests it is not fully adult. Bill is typical Mediterranean michahellis being thick, fairly long and with gonydeal bulge and steep angle at culmen. Neck is strong and head is heavy. Legs are a rather dull straw colour. 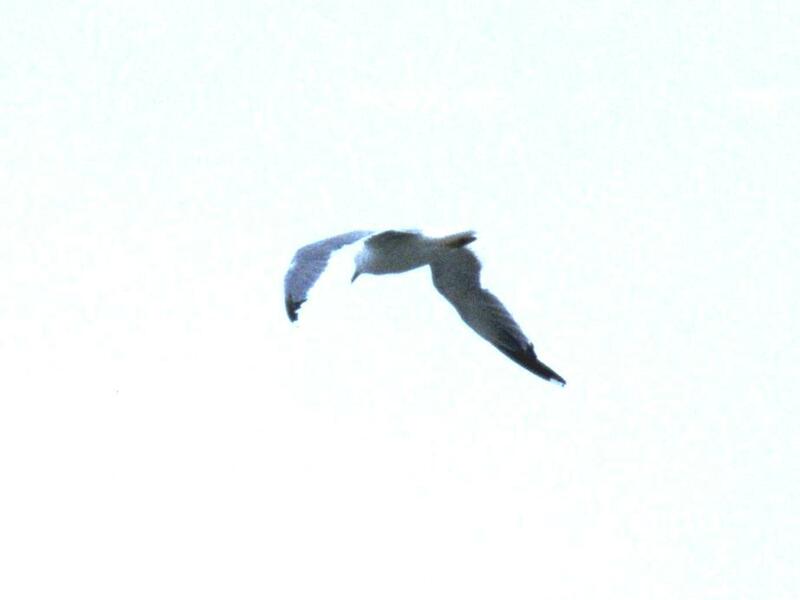 Wings are long, tail still shows some slight mottling. At dusk. Quite mottled on crown and around eye. Legs a pale yellow. Bill is a dull yellow with a clear orange-red gonydeal spot. Mantle shows no blue hint, being a dull leaden grey. 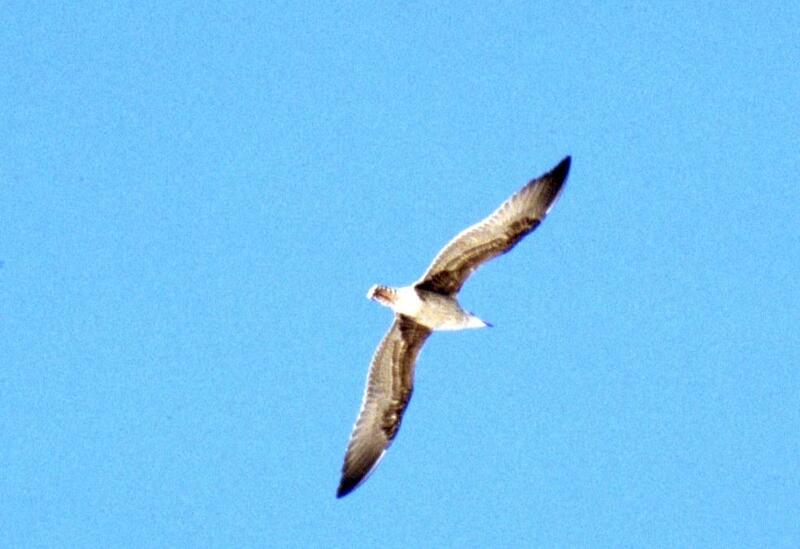 Coverts show slight mottling and no primary tips are visible on closed wing, hence probably a third-summer. 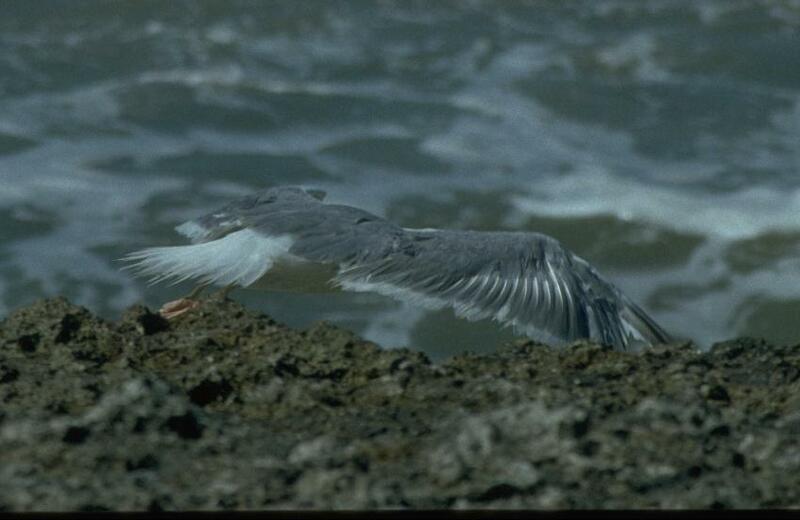 Moult is delayed with new P6 not showing yet. Legs about 85% of body above. Very worn individual, most probably third-summer. Note very long legs showing through moult of feathers on thighs. Extensive mottling on head and nape. Legs are an indistinct yellow. Both very heavily set. One is annotated above. Very contrasting underwing with bold reddish-brown underwing coverts, all black bill, barred undertail, some mottling on belly and sides of breast, white head with dark eye spot. All primaries present. All michahellis. From left: adult, juvenile, second-winter, probable third-winter, second-winter, unaged and juvenile. 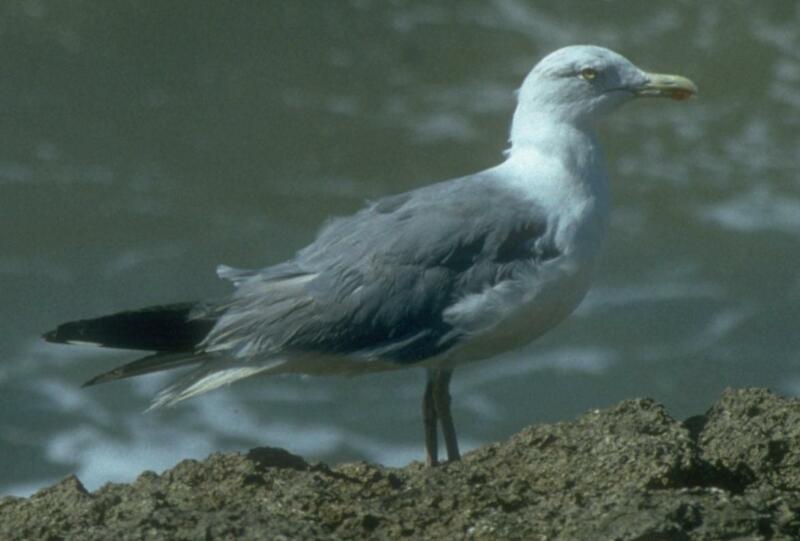 The legs are fairly long, 80-90% of body above. The mantle of the probable third-winter in the central foreground is a steely-grey. 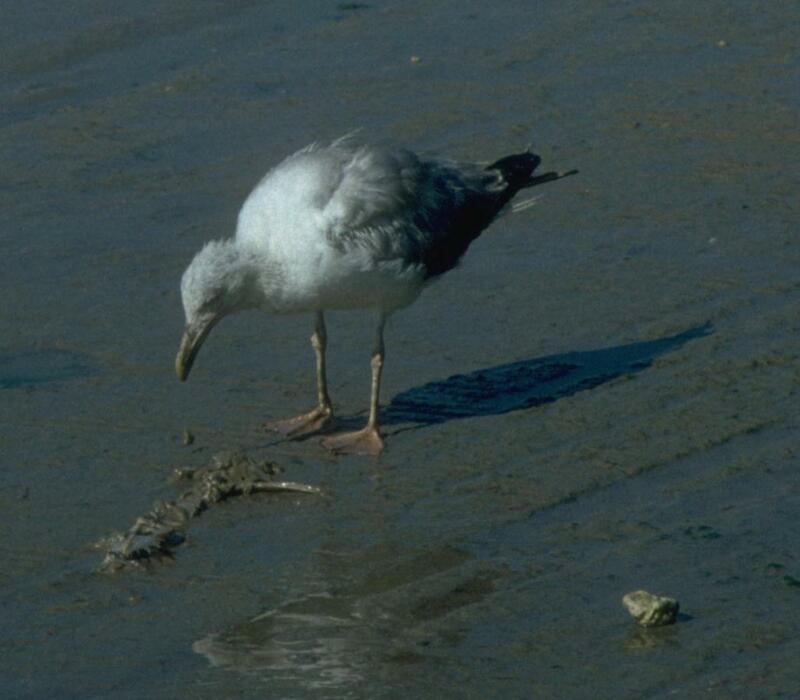 The juvenile in the top right shows a large boxy white head and all black bill. The adult on the left has new P6-P8 and is missing P9/P10. 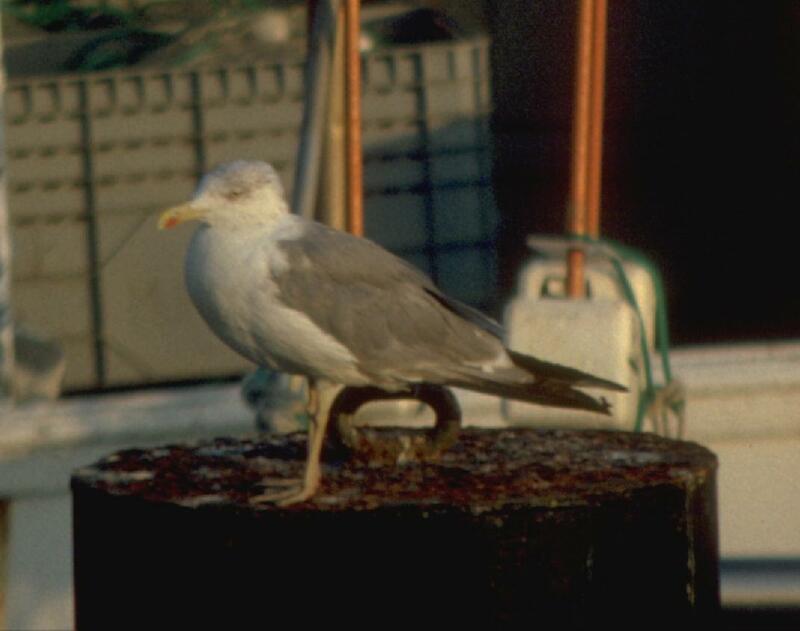 The probable third-winter in the foreground has a black subterminal band on the bill, pale yellow legs and has P6/P7 new, P10 old and P8/P9 missing. Two adult michahellis on left, one new P6, missing P7/P8 and old P9/P10, other missing at least two, probably three, outer primaries. Moving towards right, third from left is presumed adult cantabricans followed on water by juvenile michahellis/cachinnans with heavy angular head and long pencil-shaped bill, all black except for small indistinct area around base. This latter individual has a slight dusky wash on the head. 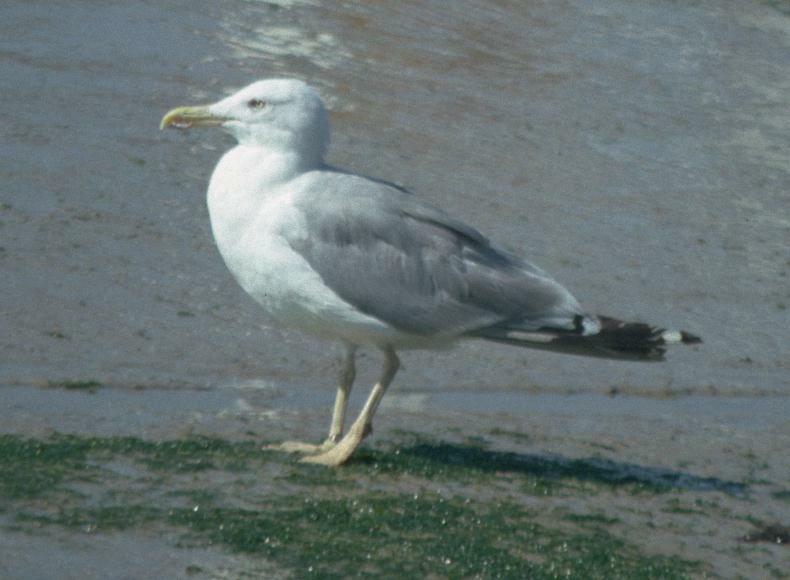 The head and bill shape are closer to Caspian Gull (Larus cachinnans) than michahellis but the darker underwing suggests michahellis. 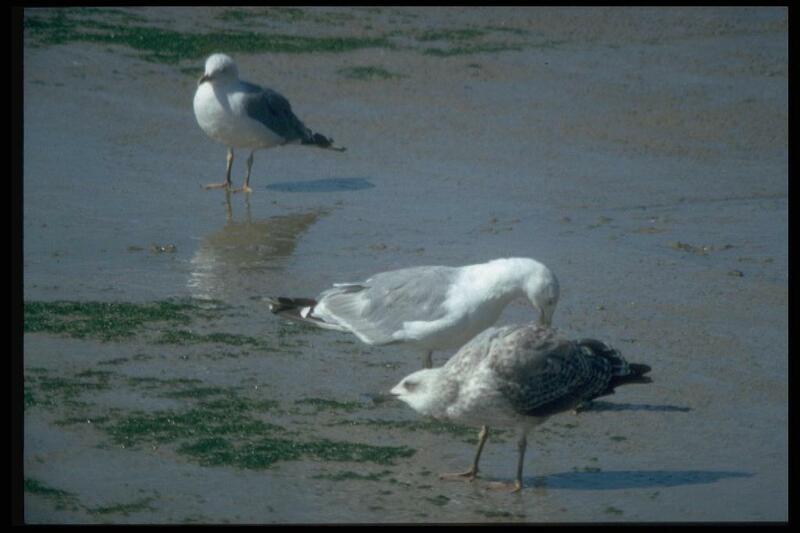 The next three, in a line, are from front: first-summer michahellis (with extensive pale area on bill and tertials but retarded amount of grey on mantle), second-summer graellsii (looking very skinny alongside the michahellis) and michahellis (classical heavy structure, possibly third-summer). 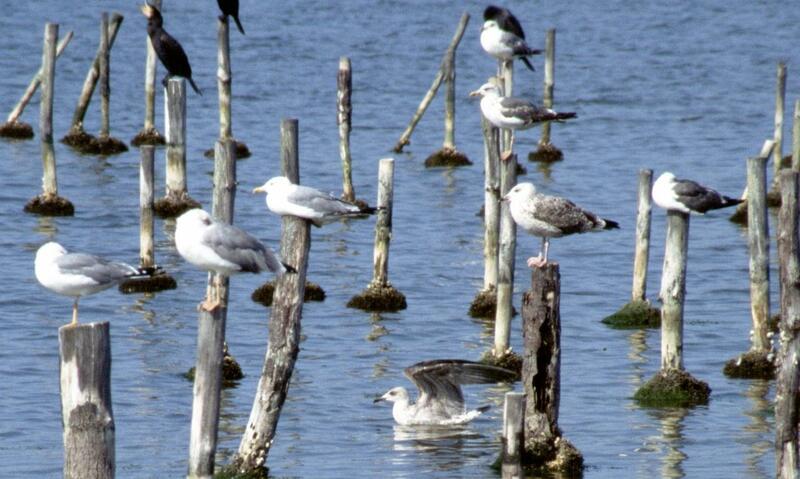 The bird on the extreme right looks like an adult graellsii/intermedius. From left, first-summer michahellis and two adult michahellis. 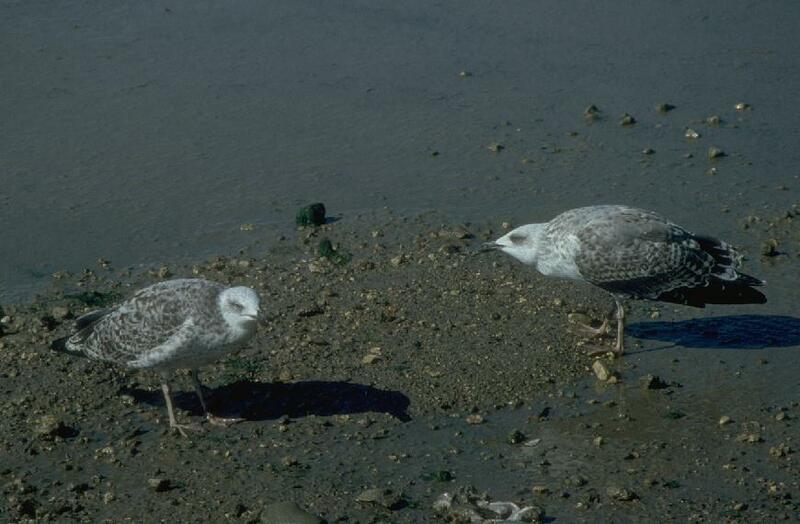 Daintier adult on right is adult cantabricans with shorter legs, smaller head, slighter bill and retarded moult (P6-P7 missing, P8-P10 old). 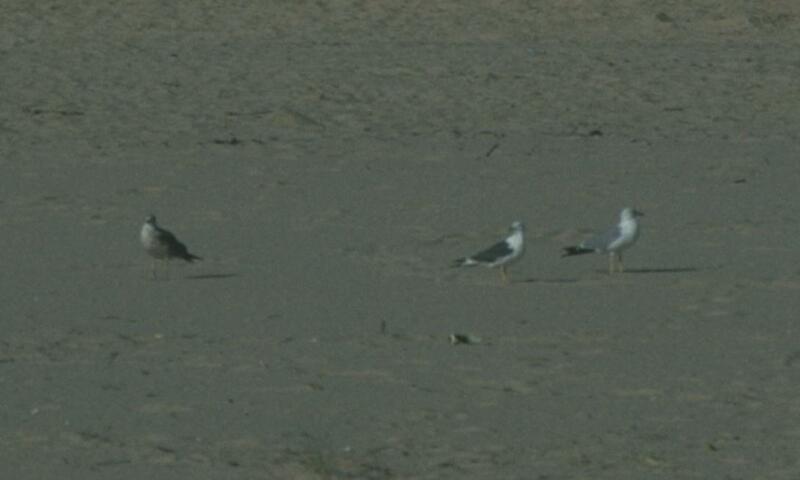 From left, two juvenile michahellis (one with broad pale fringe on tertials), cantabricans adult (bright yellow short legs), second-summer michahellis (with pale straw legs), juvenile michahellis and another adult cantabricans (paler but still short legs). 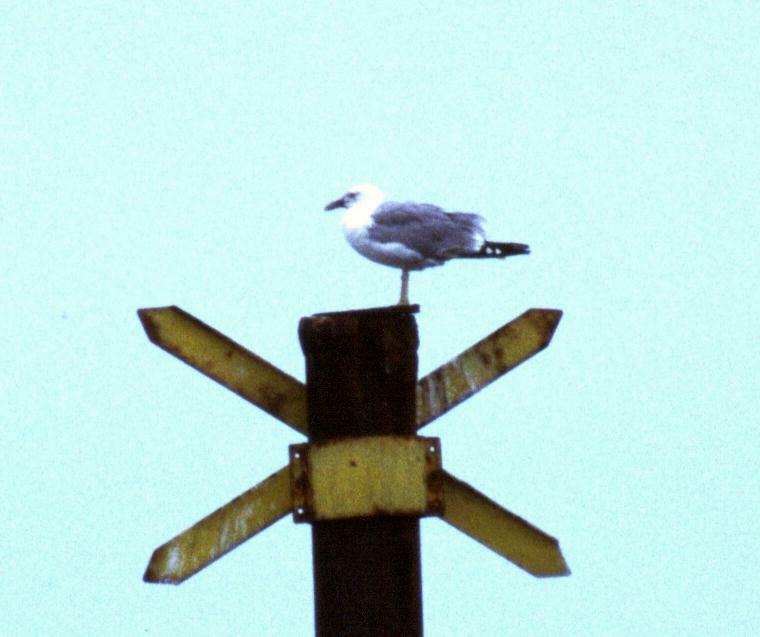 © Copyright Nick Rossiter 2000-2004.